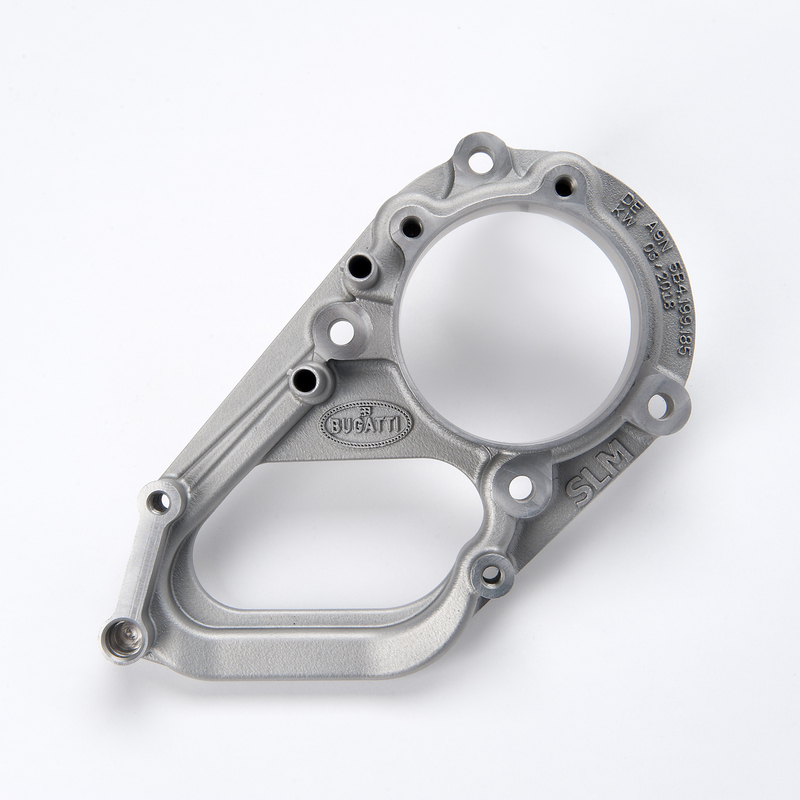 Metal additive manufacturing technology is accelerating industrial development in the automotive sector, as shown by the repeated success of the Bugatti sports car brand in achieving consistent function integration and significant performance optimization of components. 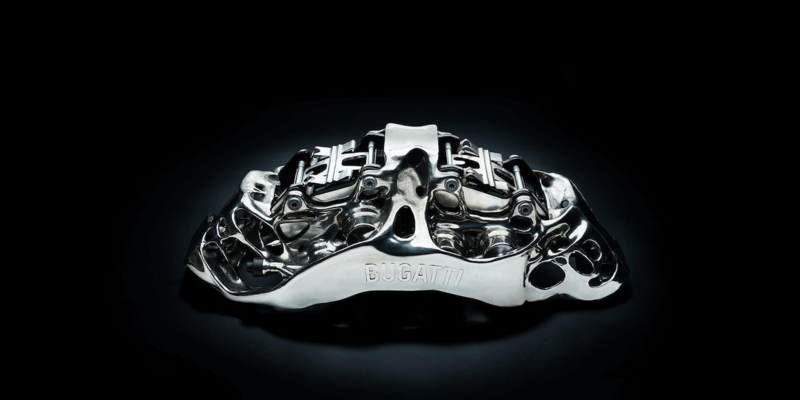 Multiple metal 3D-printed functional components from Bugatti have been produced on machines developed and manufactured by SLM Solutions. “Proof that additively produced metal components can cope with extreme strength, stiffness and temperature requirements at speeds of over 375km/h (233mph) with a braking force of 1.35g and brake disc temperatures up to 1,100°C”, says Frank Götzke, head of new technologies at Bugatti. The caliper test showed that a tensile strength of 1,250 N/mm2 and a material density over 99.7% was achieved. 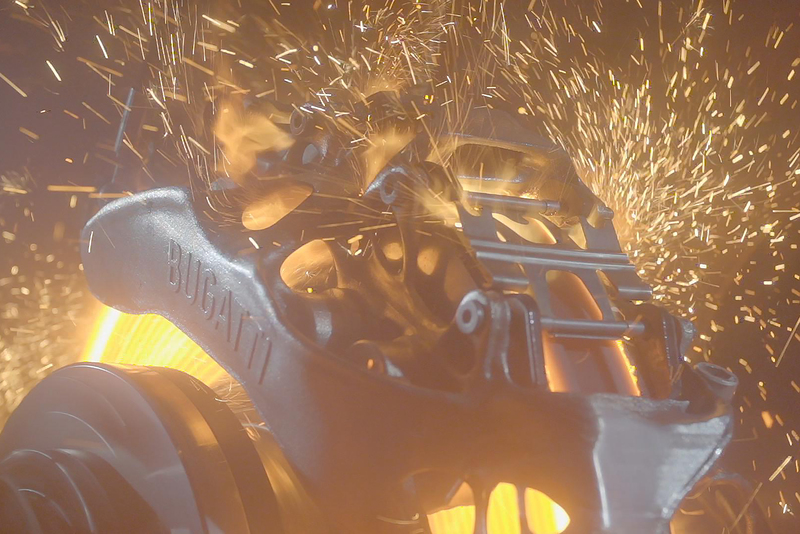 Bugatti utilizes selective laser melting, not only for lightweighting, but also within the functional scope of its vehicles. “We always strive for absolute perfection, stylistic as well as technical, and we consider the perfect synergy of both elements – upholding the traditions of Ettore Bugatti,” Götzke states. The active spoiler bracket, manufactured using an SLM 500 machine with Fraunhofer IAPT (formerly Laser Zentrum Nord), represents this combination, aiding the 1,500hp vehicle to reach speeds of 400 km/h in just 32.6 seconds and helping bring it back to a stop in just nine seconds. The active rear spoiler can be adjusted in height and angle, supporting the sophisticated aerodynamics required for the car. Bugatti teamed up with Siemens to optimize the bracket for production and reduce the number of iterations needed to optimize for weight and rigidity. 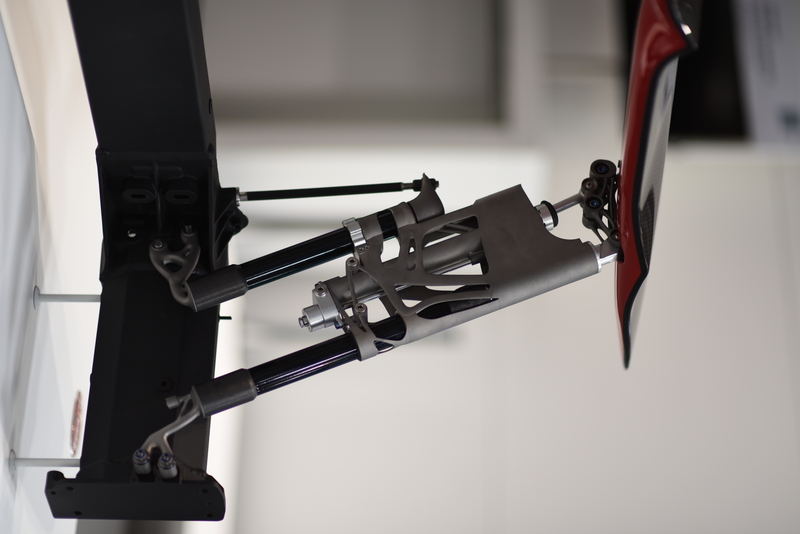 Utilizing 3D-printed titanium with a tensile strength of 1,250 MPa and a material density of over 99.7%, the spoiler bracket was reduced by 5.4kg, a weight reduction of 53%, yet rigidity was increased while sacrificing no functional benefits. The Chiron, like its predecessor, the Veyron, has two separate water-cooling circuits to keep the component and system temperatures at an acceptable level, even under the most extreme environmental and operating conditions. The high-temperature circuit is used to cool the 1,500hp W16 engine of the supercar, while the low-temperature circuit ensures that the intake charge cooling temperature remains suitably low. The bypass flow filter of the NT circuit supplies the console while isolating the electronic components from the temperatures of the transmission oil tank. The primary task of the bracket is to engage the gears while opening and closing the two clutches of the seven-speed dual-clutch transmission while including the control unit. As a result, the temperature at the electric motor and at the control unit of the pump when driving through a demanding handling course can be lowered from 130°C to 90°C, a reduction of 40°C. However, the start of the cooperation between the Volkswagen subsidiary, Bugatti and the SLM Solutions Group AG dates back to the design, calculation and later production of a bionically optimized front axle differential housing at the turn of the year 2014/2015. Bugatti manager Götzke recalls a chance meeting in the parking lot of the Volkswagen Tor Ost headquarters in Wolfsburg, stating that this was “… a real stroke of luck” that continues today. Ralf Frohwerk, global head of business development at SLM Solutions, the first and current Bugatti contact at SLM, emphasizes that this has indeed resulted in a very trusting cooperation from the outset. Incidentally, that front axle differential housing was manufactured by Audi AG at its company locations in Ingolstadt and Györ on SLM 280 machines, with the objective of comparing the influencing factors of varying locations in regard to component quality. According to Frank Götzke and Ralf Frohwerk, this cooperation will only grow.